Images shape our desires. As much as we like to think we’re immune to their influence, that we can encounter them without letting them tell us what is good or true or beautiful, they tend to work a subtle magic on us, especially after years of constant exposure. I’m talking not just about advertisements and entertainment media, which perpetuate the myth that only one particular type of female body is attractive, and likewise one particular type of male body, and train us to desire that type for ourselves and for our partner. I’m talking too about the seemingly innocuous images posted on social media. Studies have shown that regularly browsing Facebook, for example, can lead to depression, as users engage in social comparison that may cause them to resent both others’ lives as well as the image of themselves they feel they need to continuously maintain. A network member posts a photo of the just-because gift her amazing, so-thoughtful husband just bought her, and it makes you feel less loved. Another one posts a selfie taken from his scuba dive in Malta, and you wonder where all the adventure has gone in your life. A friend from high school posts a whole album of birthday photos of her two-year-old, and you are reminded of your ticking biological clock, or of her twenty-two-year-old in cap and gown, and you wish your kid had decided to go to college. There’s nothing inherently wrong with images—creating or consuming. In fact, we need them. But we also need to beware of the propensity they have to plant themselves firmly in our minds and become idols. Whether it’s a perfume commercial on TV or an exotic dinner photo on Instagram, we need to break the power certain images have over us. Instead of allowing images to name us (“ugly,” “boring,” “unwanted,” “failure”), we must name them—denounce as false and unholy any image that claims ultimate authority in our lives, or that tries to redefine who we are against the definition scripture already gives us: we are Christ’s. In his essay “The Desire of the Church,” published in The Community of the Word: Toward an Evangelical Ecclesiology (InterVarsity Press, 2005), Willie James Jennings discusses the distortion of sight and desire that is the result of the Fall. The tree of knowledge, he writes, was the first unholy icon in human history—an icon in the sense of being “a point of focus that facilitates desire and guides relationships” and “nurtures our seeing and knowing,” and unholy because to look on it was to begin the journey of disobedience. Gazing on the unholy icon of the tree, Adam and Eve saw themselves refracted through it, instead of gazing on God and seeing themselves reflected. By turning their gaze off God and fixating it on something lesser, they stopped seeing themselves, each other, and their Creator rightly. 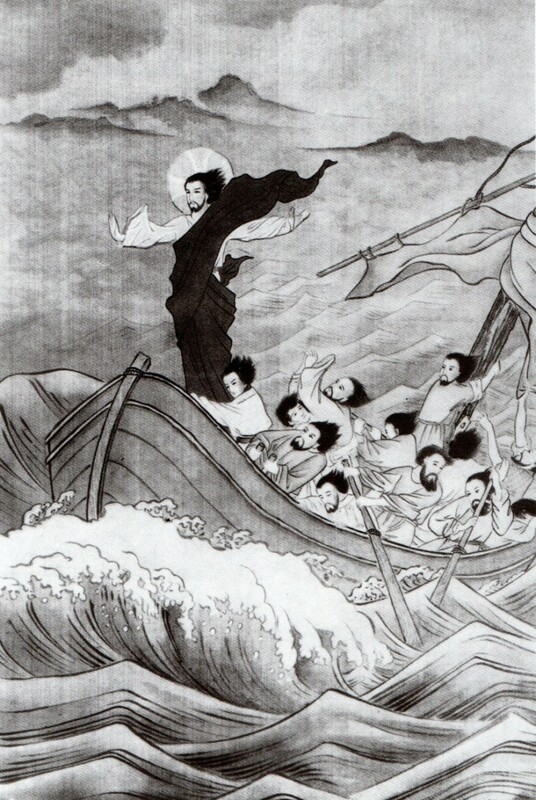 “The only way to reverse this journey of disobedience,” Jennings says, “is to establish a new point of focus.” So into humanity comes the holy icon—Jesus Christ—whose life overcomes the fracture and fragment of desire. As the image of the invisible God, he reorients our gaze back onto the holy. I’ve already named some of the images that function as unholy icons in my life: pictures of thin, unblemished bodies that tell me my shape and my spots are not desirable; of global travel destinations that tell me I lead a tethered, play-it-safe life; Pinterest boards that tell me my home and meals and parties need to burst with DIY flair. It’s impossible to avoid these throughout the day, but because I know I’m particularly vulnerable to their refractive influence, I try as best I can to avoid locking my heart-gaze on them. Again, they’re not intrinsically unholy; it’s only when I let them shame me or question my identity in Christ that they become so. I desire too much to be beautiful, bold, sophisticated, and creative that it sometimes diverts my focus from the One I was made to desire supremely. If gazing on Christ is the solution to having right sight and desire restored, how, logistically, can that happen, being that he’s absent in the flesh? As Jennings says, “desiring is bound to seeing, to taking in what is before us,” suggesting that a material presence is required. 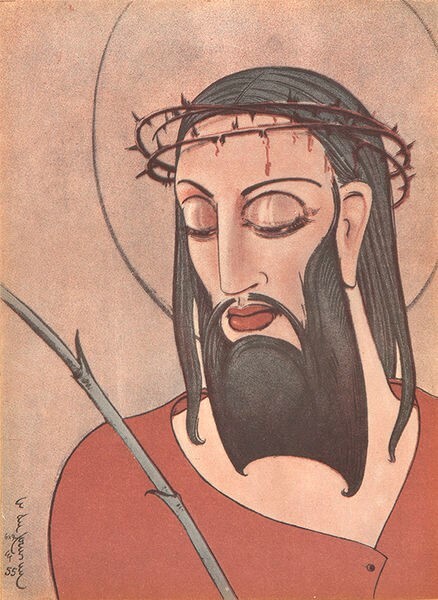 Orthodox believers developed the practice of icon writing and veneration to address this question—creating physical images of Christ to mediate his presence and to serve as an anchor in daily life. 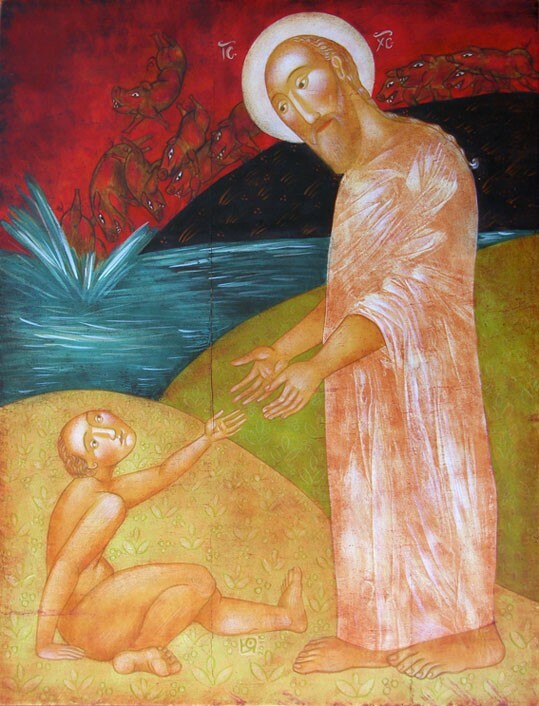 The Incarnation, they say, renders icons absolutely essential to the task of knowing God. My own Protestant theology of images owes much to the Orthodox view but deviates from it as well. Although I acknowledge the revelatory potential of images, I do not regard them, as the Orthodox do, as on a par with scripture. Another key distinction is that I admit into my devotional life a range of sacred images, not just those that fall within the rigorously guarded canon of Orthodox iconography. I use them as an aid to prayer, but I do not reverence them with actions like kissing or lifting—not necessarily because I’m opposed to such displays but more likely because I’m naturally reserved, and also I’m usually interacting with the images digitally. I define “holy image” as any image that draws the viewer closer to Christ. The religious background of the artist is, to me, irrelevant, and what functions as a holy image to one person might not for another. You sanctify the image by letting it lead you into communion with God. Part of my private spiritual practice is to spend a little time each day gazing on a holy image. I’m particularly fond of ones of Christ. For me this gazing serves a centering function; it reorders my desires. Sitting still with an image of Christ reminds me of Whose image I bear, and I take that with me as I encounter other images throughout the day that try to tell me otherwise. I desire peace—and not just any old peace, but the peace that Christ gives, and not just for myself, but for the world. Monika Liu Ho-Peh, The Stilling of the Tempest, 1950s. 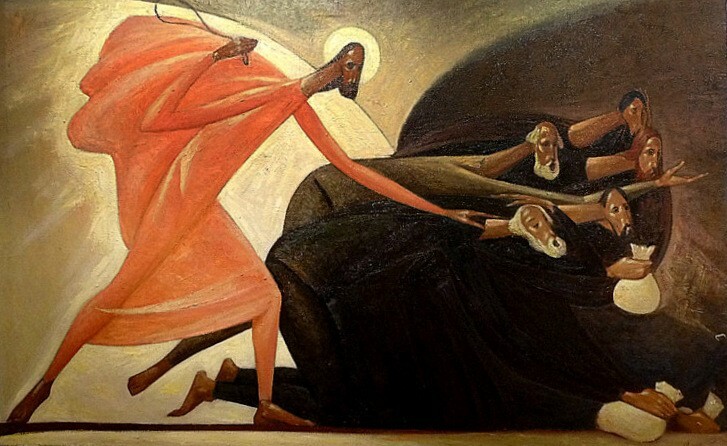 Julia Stankova, The Healing of the Demon-Possessed Man, 2010. Tempera, gouache, watercolors, and lacquer technique on wood, 40 × 31 cm. 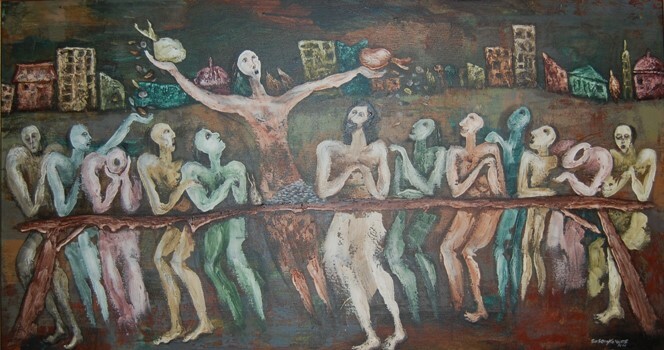 Wisnu Sasongko, Zacchaeus, 2005. 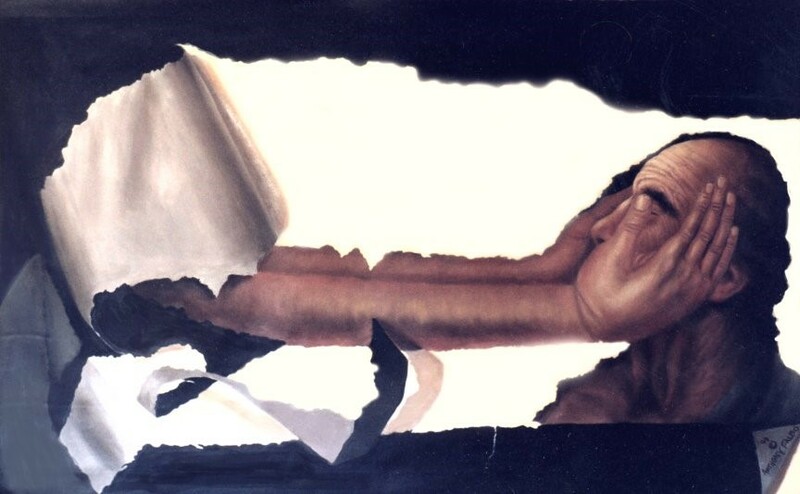 Acrylic on canvas, 28 × 52 in. I desire to touch Christ’s wounds. Right panel of an ivory diptych depicting the Incredulity of St. Thomas, made in Trier at the end of 10th century. Bode Museum, Berlin. 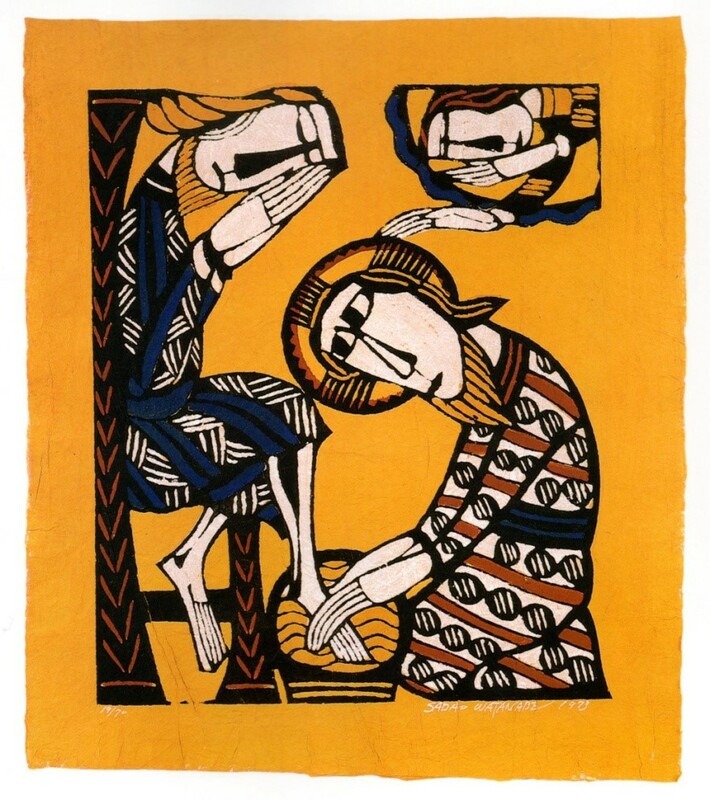 Sadao Watanabe, Jesus Washes Peter’s Feet, 1973. Stencil print, 26 × 22.75 in. 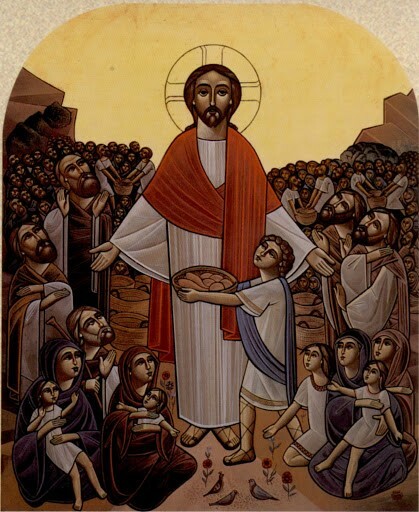 Isaac Fanous, Jesus Feeding the Multitude. and to help people see. 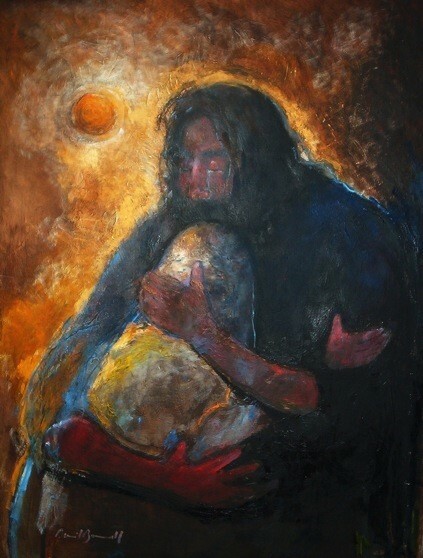 Anthony Falbo, The Healing of the Blind Man. I desire to practice resurrection. 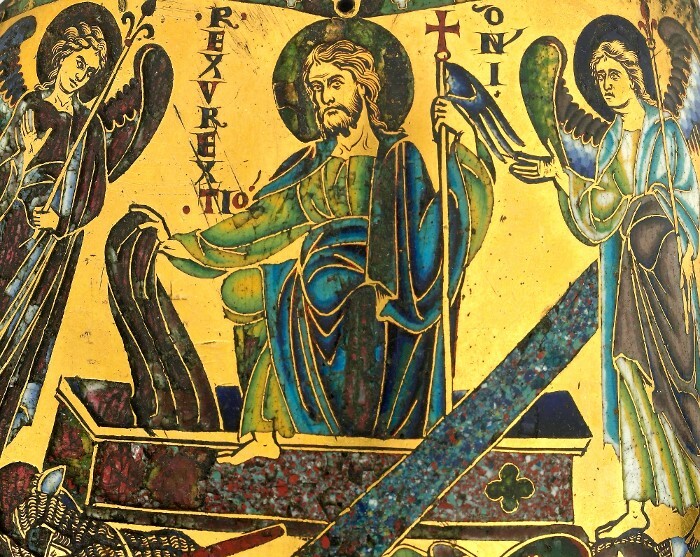 The Resurrection (detail), ca. 1170–80, Rhine-Meuse region. Champlevé enamel on gilded copper. Musee du Louvre, Paris. I desire Holy Spirit fire. 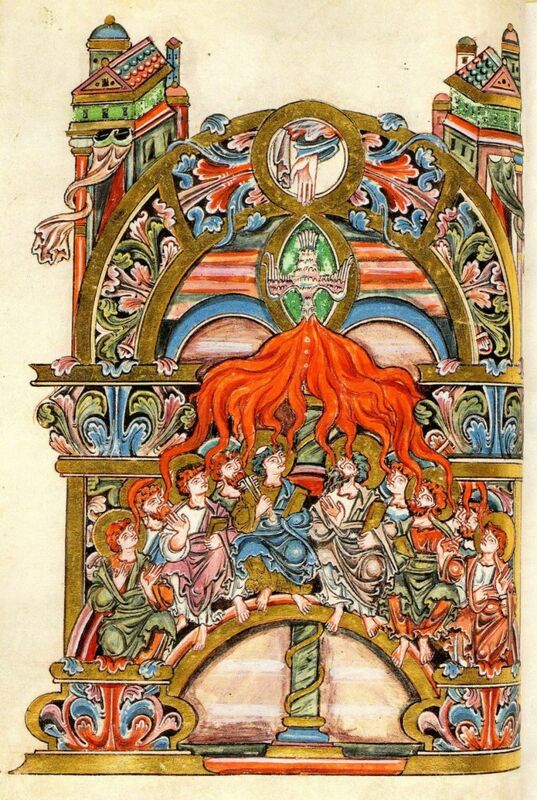 Pentecost, from the Benedictional of Archbishop Robert, New Minster, Winchester, ca. 980. Bibliothèque Municipale de Rouen, MS Y.7(369), fol. 29v. I desire to preach truth. 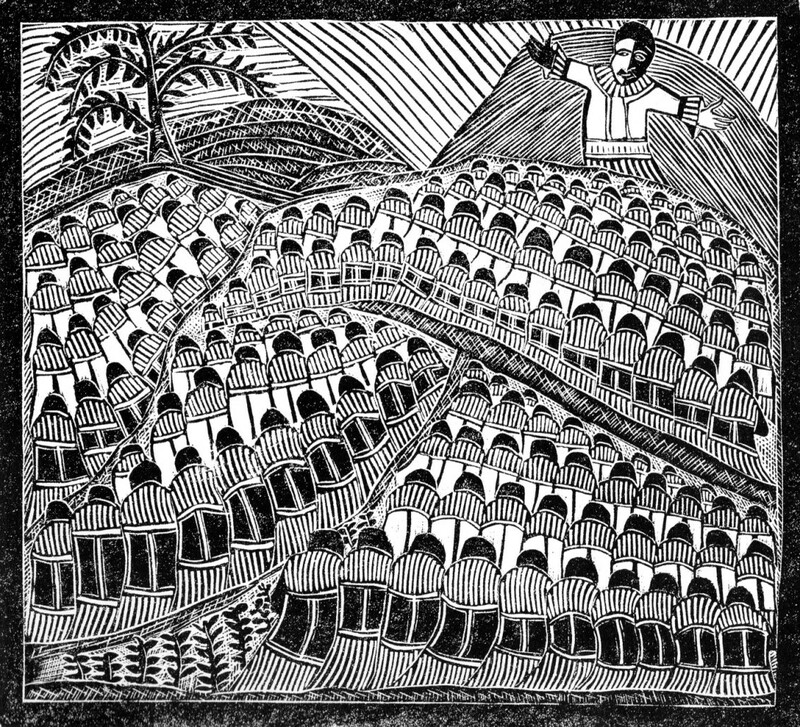 Azaria Mbatha, Sermon on the Mount. 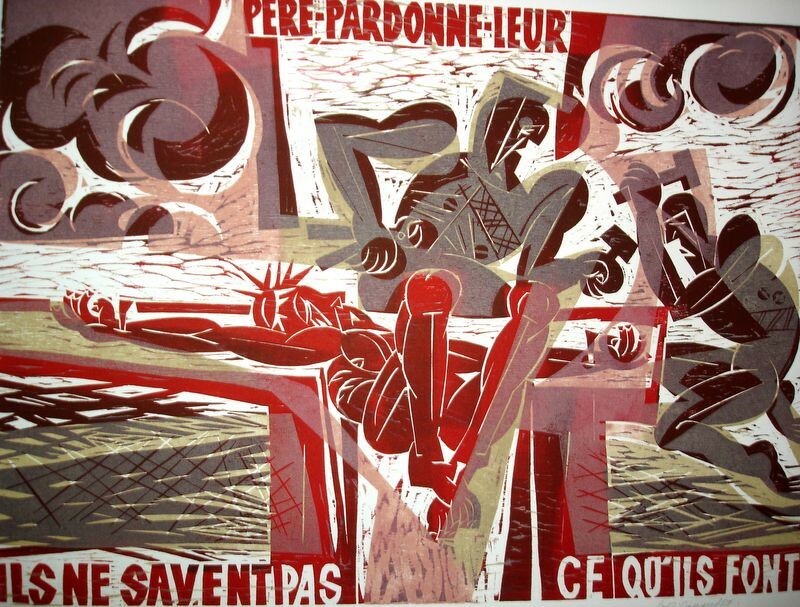 Linocut. 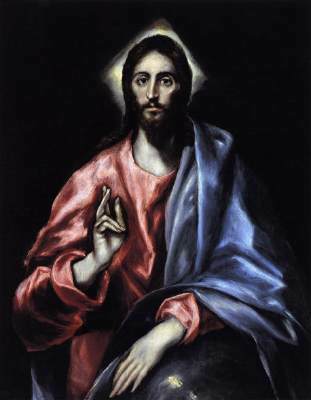 El Greco: Christ as Saviour, 1610-14, Oil on canvas, 99 x 79 cm. I desire to suffer with dignity. 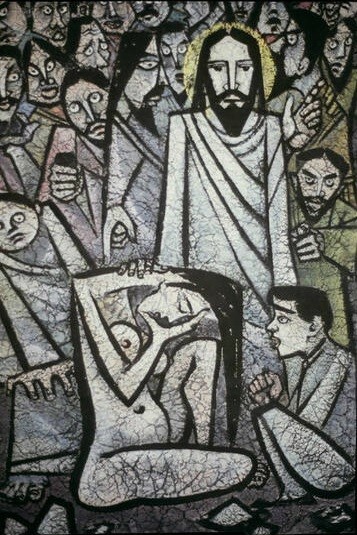 Angelo da Fonseca, Ecce Homo, 1955. Watercolor, 9 x 6 in. I desire to stand up for justice. Alexander Smirnov, The Cleansing of the Temple. Oil on canvas. Kim Young Gil, The Woman Caught in Adultery. Sassandra, Father, Forgive Them. Color woodcut. I desire to weep with those who weep. Daniel Bonnell, Jesus Wept. Oil on canvas, 46 × 34 in. 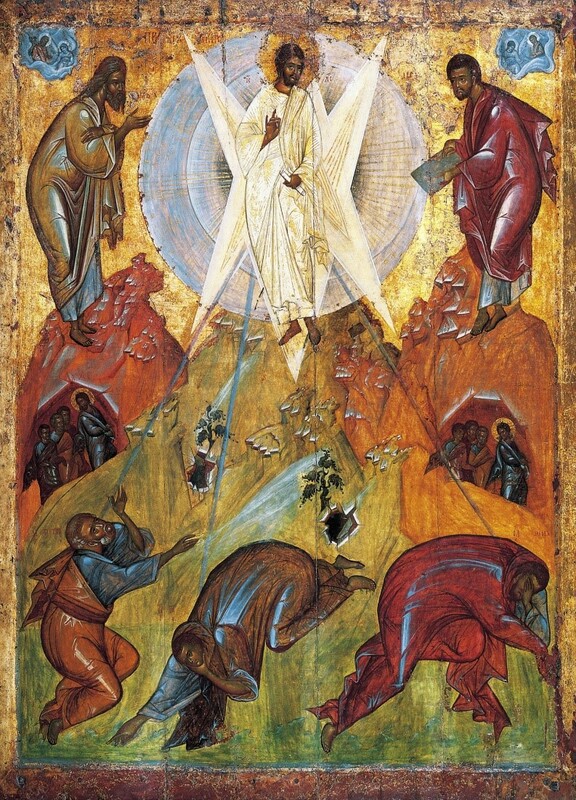 Attributed to Theophanes the Greek, The Transfiguration, 1408. State Tretyakov Gallery, Moscow, Russia. We are shaped by what we see, and I want to be shaped by the right things. We can have unholy icons nurturing our seeing and knowing, or we can have holy ones. I choose holy.